Le Club AccorHotels has launched new double & triple points offers for stays in Skopje (Macedonia) and Sofia (Bulgaria). You earn double points on Monday, Tuesday, Wednesday and Thursday nights, and triple on Friday, Saturday and Sunday for stays both consumed and booked October 1 – December 31, 2015. You can access this offer Le Club AccorHotels website here. Both Skopje and Sofia are interesting cities. I was in Skopje this past July and saw the ibis hotels, although stayed at the Holiday Inn. There are quite a few hotels options to stay at in Sofia. These double/triple points are one thing to consider for those that will stay at these two cities before the end of the year. 1. 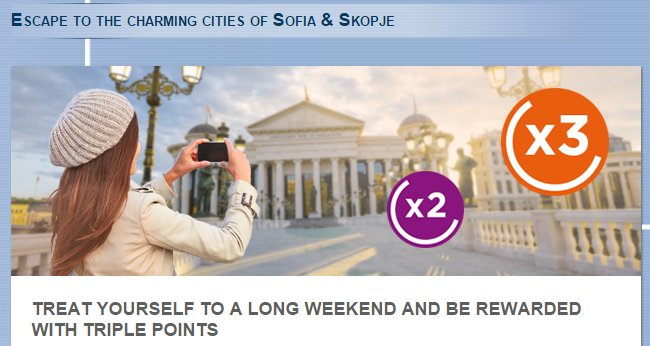 General Le Club Accorhotels terms and conditions apply to “Escape to the charming cities of Sofia & Skopje” offer. 2. This offer is valid for any stay done between 01/10/2015 and 31/12/2015 in one of the participating hotels, and booked between 01/10/2015 and 31/12/2015. 3. This offer entitles Le Club Accorhotels Loyalty program members, regardless of their status, to benefit from earning double points on weekdays (Monday to Thursday) and earning triple points on weekend stays (Friday to Sunday) in one of the participating hotels in Bulgaria and Macedonia. 5. You must book your stay ahead of time on-line to benefit from this offer (www.accorhotels.com or brands.com) or via our Accor call centers.